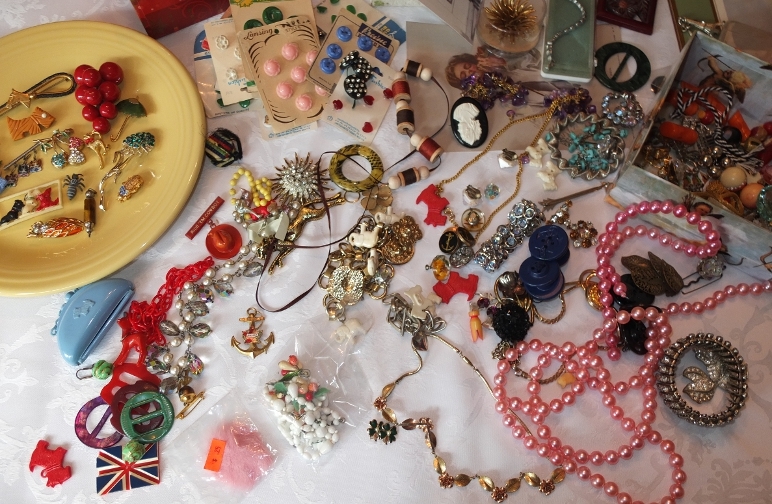 Treasure Trove | Oh, for the Love of Vintage! Sorry I’ve been ‘missing in action’ and haven’t written a blog post in a little while. I’m on vacation and visiting my family in my hometown. There truly is no place like home! 🙂 I love visiting here because I get to spend time with my amazing family and also do some treasure hunting! First of all, I’m completely overwhelmed by the stunning items my mother has given me. 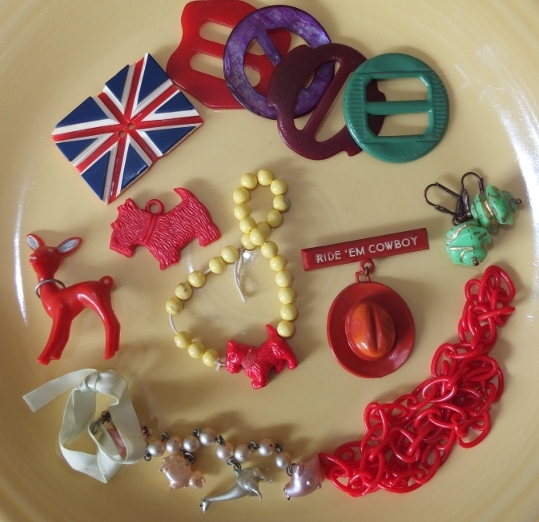 Just wait until you see the lovely reverse-carved lucite, vintage rhinestone collection and novelty celluloid jewellery! *swoons* I’ve also purchased some cute Bakelite bangles, but I’ll save those for another post. 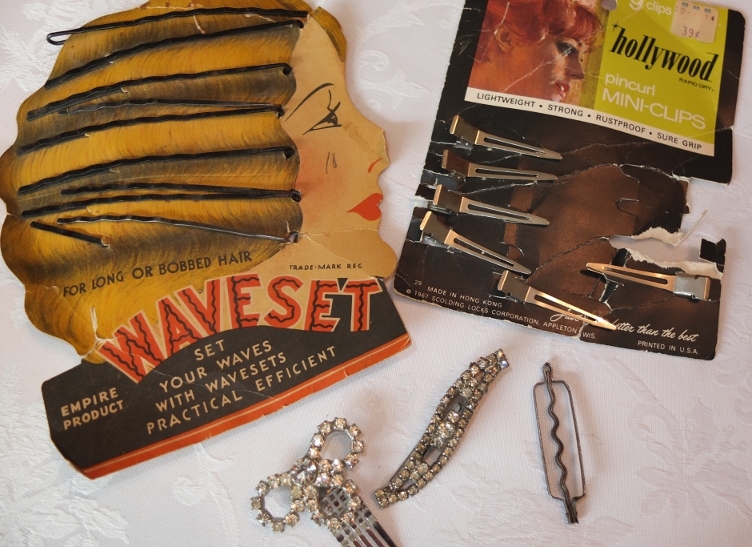 It’s a shame that the wave bob pins are rusty, or I would have tried them out on my hair! 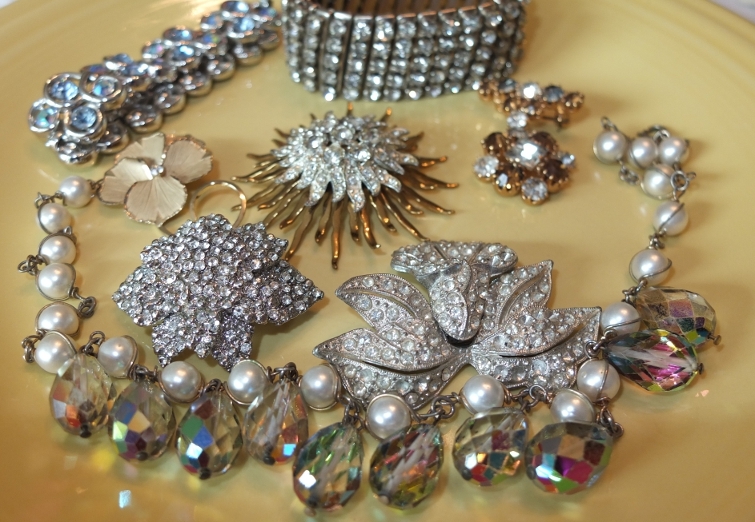 Some beautiful rhinestone jewellery for special occasions and dress up time! 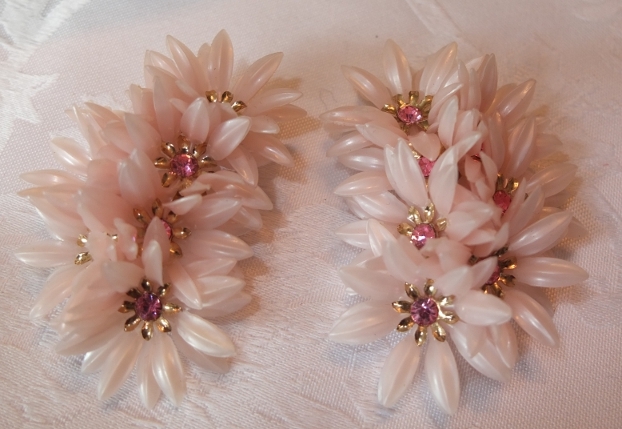 Just look at these plastic Coro floral earrings, amazing and so over-the-top! The Coro Earrings are absolutely gorgeous, wow! Where did you find those? I really miss wearing earrings, sigh. Theadora, I knew you’d like these gems! 🙂 Yes, the red, black and white brooch has three cute Scottie dogs on it. All of these items are gifts from my mom. 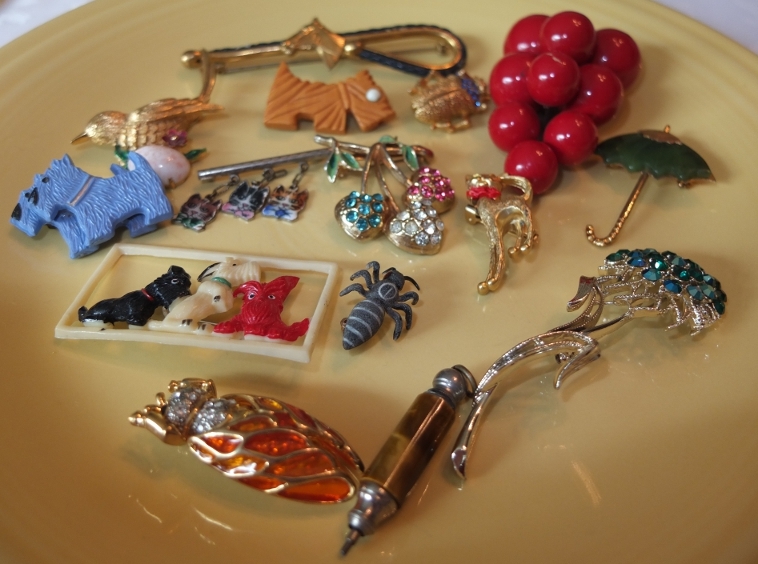 Some were from her collection, some flea market and yard sale finds. There are a few pieces I’d like to research including a few designer pieces. I definitely enjoy researching! I gauged my ears when I was 15… sigh. Here I am, seven years later.. oh well. I’m planning to get the “fixed” sometime this year, which is not that expensive.. I fear for my wallet though once it’s done 😀 So many cute things to buy! And you were lucky finding these, they are so unique! Hi Katie! I understand completely. I had tattoos done when I was 15 and pretty much ever since (over 15 years since then), I’ve regretted it. Oh well…at least you can get yours fixed! I realize now you’re Katie from FL! Happy to have you reading my blog as I love yours! Sounds like you’re having a great time and all your lovely finds are just the icing on the cake. Enjoy! I love, love, love costume jewelry. And you’ve got some fabulous pieces here! Those Coro earrings are out of this world! I do too! I can’t seem to stop collecting and wearing it! ;0 Do stayed tuned, as those Coro earrings will be going up for a giveaway on this blog SOON! « Let’s Get Cooking Chicken Parmesan!